#01 Connected life: take care of your eyes! 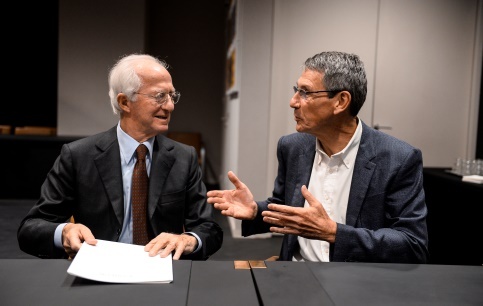 Charenton-le-Pont, France and Milan, Italy (July 26, 2018) – Essilor (Euronext Paris: EI) and Luxottica (MTA: LUX) announce that the antitrust regulator of the People’s Republic of China, SAMR, has approved the proposed combination between the two companies after they made certain commitments with regard to the conduct of their business in China. These commitments are fully aligned with the future EssilorLuxottica’s mission to “help people see more, be more and live life to its fullest” and the open business model both companies promote across the globe. Clearance from Chinese authority was the last condition precedent to the closing of the transaction and paves the way for the combination to be finalized. The two companies are also progressing with their discussions with the Turkish antitrust authority and expect the closing of the transaction at the end of the third quarter. This press release does not constitute or form a part of any offer or solicitation to purchase or subscribe for securities in the United States or any other jurisdiction. Securities may not be offered or sold in the United States unless they have been registered under the U.S. Securities Act of 1933, as amended (the “U.S. Securities Act”), or are exempt from registration. The securities that may be offered in any transaction have not been and will not be registered under the U.S. Securities Act and Essilor does not intend to make a public offering of any such securities in the United States. This press release is only being distributed to and is only directed at (i) persons who are outside the United Kingdom or (ii) investment professionals falling within Article 19(5) of the Financial Services and Markets Act 2000 (Financial Promotion) Order 2005 (the “Order”) or (iii) high net worth companies, and other persons to whom it may lawfully be communicated, falling within Article 49(2)(a) to (d) of the Order (all such persons together being referred to as “relevant persons”). The securities which are referred to herein are only available to, and any invitation, offer or agreement to subscribe, purchase or otherwise acquire such securities will be engaged in only with, relevant persons. Any person who is not a relevant person should not act or rely on this document or any of its contents. Essilor commercial brand: what’s behind the new campaign? Please attach your CV and letter of motivation which we will review carefully. If you don't get a response from us within a month, it means that your application does not meet our current needs. However, please continue to check our website as we regularly publish new job offers. By sending the form above, I acknowledge that I have read the Privacy Notice and that I have been fully informed of the terms and conditions under which Essilor International processes my personal data.